A new inspection report on Magilligan prison is the most positive ever about a jail in Northern Ireland. 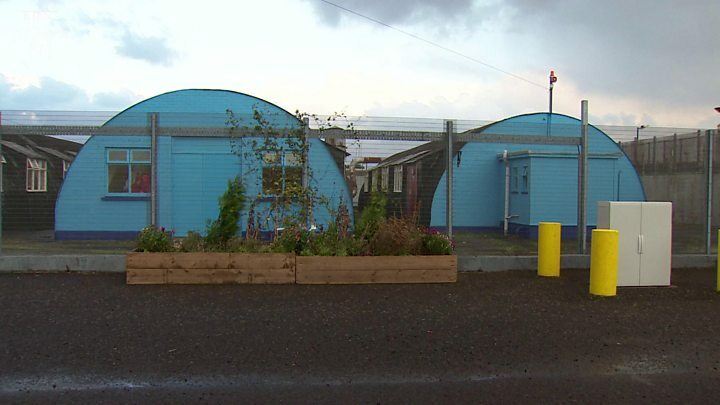 The report, published on Tuesday, describes progress at the prison near Limavady since it was last inspected three years ago as "immensely encouraging". The inspectors praised the leadership within the prison and a "positive culture" between staff and prisoners. But they said there were a number of areas of concern. These include the availability of illegal drugs and misuse of prescription medicine, and poorer outcomes in key areas for Catholic prisoners. There are currently 442 prisoners held at Magilligan, a medium-security jail. The unannounced inspection was carried out over a two-week period in June. It was conducted by Criminal Justice Inspection Northern Ireland (CJI) and Her Majesty's Inspectorate of Prisons in England and Wales (HMIP), with support from the Regulation and Quality Improvement Authority (RQIA) and the Education and Training Inspectorate (ETI). They said improvements had been made in a number of key areas. This included the amount of time prisoners spend out of their cells and engage in purposeful activity. The report said the "quality of what we observed was good to outstanding". "However, when we visited the prison in June this year, we found excellent progress had been made in this area. "Time out of cell was much improved and learning, skills and work provision had moved forward significantly with about three quarters of the men held there engaged in a range of purposeful activity." The inspectors also praised the relationship between staff and prisoners, which they described as "often exemplary". Image caption The inspectors said resettlement work was "a significant strength"
"We observed constructive, friendly relationships between staff and prisoners which contributed to a calm and settled atmosphere around the prison," the report added. A survey conducted by the inspection team found that 80% of the prisoners who took part said they were treated with respect and knew a member of staff to whom they could turn for help. There is also praise for the resettlement work at Magilligan, which is described as "a significant strength". The positive findings have been welcomed by the head of the prison service, Ronnie Armour. "We are absolutely delighted with this inspection report. It is a tribute to the governor and staff who work here," he said. "They work exceptionally hard, they obtained the highest score possible in terms of how they treat prisoners and also in terms of what they are doing to prepare them for release." On a negative note, the inspectors said their survey found that more prisoners than in the last inspection three years ago reported feeling unsafe or being victimised. They also expressed concern that an integrated drugs and alcohol strategy, aimed at reducing supply and addressing the needs of prisoners with substance misuse or addiction problems, still did not exist at Magilligan. "We recommend there should be a prison-wide drug and alcohol strategy with an associated action plan to address both supply reduction and support issues," said Peter Clarke, Her Majesty's Chief Inspector of Prisons in England and Wales. In response, the prison service said it would "urgently look to put a strategy in place". The inspectors also called on the prison service to bring in independent support to establish why there are poorer outcomes for Catholic prisoners. This is an issue inspectors had highlighted previously in reports about all prison establishments in Northern Ireland. "There continued to be poorer outcomes for Catholic prisoners in a range of important areas, often where staff discretion was involved and, in our survey, Catholic prisoners were more negative than Protestants about respectful treatment by staff," the report states. The prison service has said it was concerned by that finding. Mr Armour said he accepted the recommendation and has employed an independent expert to address the issue.